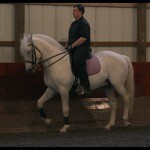 We offer lessons in French Classical Dressage. 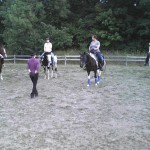 Lessons include groundwork (lunging and work in hand) as well as work under saddle. School horses are available. Students are taught how to communicate with the horse in a language that the horse is able to understand. This creates a willingness in the horse to work with the rider. The horse is taught to carry himself in a position that will best enable him to support a rider. This decreases injuries and increases the horse’s longevity. 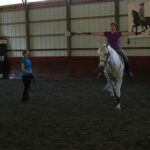 The rider is taught to sit in a balanced position so she can best influence the movement of the horse. Dressage work is highly beneficial for horses of all disciplines. Do you have a child who loves horses and wants to learn how to ride? Or are you an adult who remembers that childhood dream of working with horses? 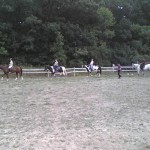 We have experience working with beginner riders of all ages. Dressage provides an excellent foundation that will stay with the rider throughout their riding career regardless of the discipline they choose to pursue. Safety of the horse and rider is of utmost importance and time is devoted to creating a firm understanding of the basics. Students learn not only how to ride but also how to care for horses and work with them on the ground. 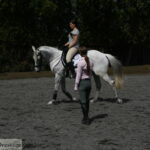 Lunge lessons are a great way to increase your confidence in your riding. Bethany has successfully helped several students overcome their fears of riding through the use of lunge lessons and confidence building exercises. Liberty work is a great way to reinforce good ground manners as well as develop a better relationship with your horse. 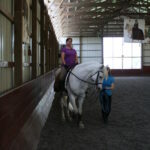 We are now offering lessons at Dover Stables in Waterford, WI or are available to come out to your farm.